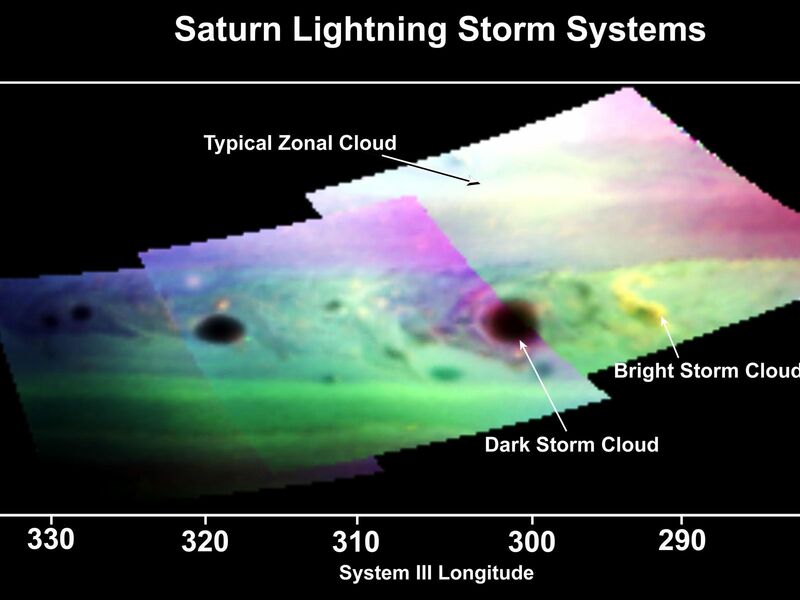 This false-color image, made from infrared data obtained by NASA's Cassini spacecraft, shows dark and bright clouds on Saturn associated with thunderstorm activity. Convection generated by the storm appears to cause ammonia gas in the upper atmosphere to rise. Bright ammonia clouds, such as the s-shaped one on the right, become visible. Lightning that strikes methane in the atmosphere appears to create materials such as carbon soot and graphite. These sooty clouds appear to bloom after the bright clouds. Scientists assigned red to show reflected sunlight from Saturn's clouds at 0.93 microns in wavelength. Green shows reflected light at 0.90 microns in wavelength, which denotes atmospheric methane absorption. 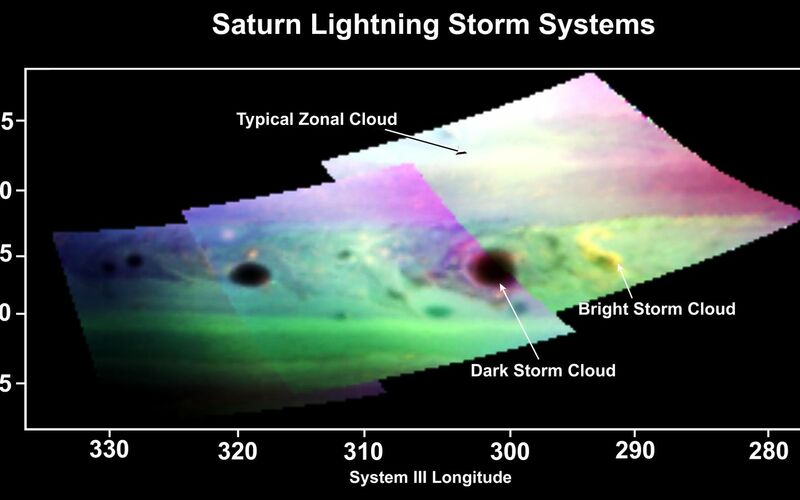 Blue shows reflected sunlight from Saturn's clouds at 2.73 microns in wavelength. 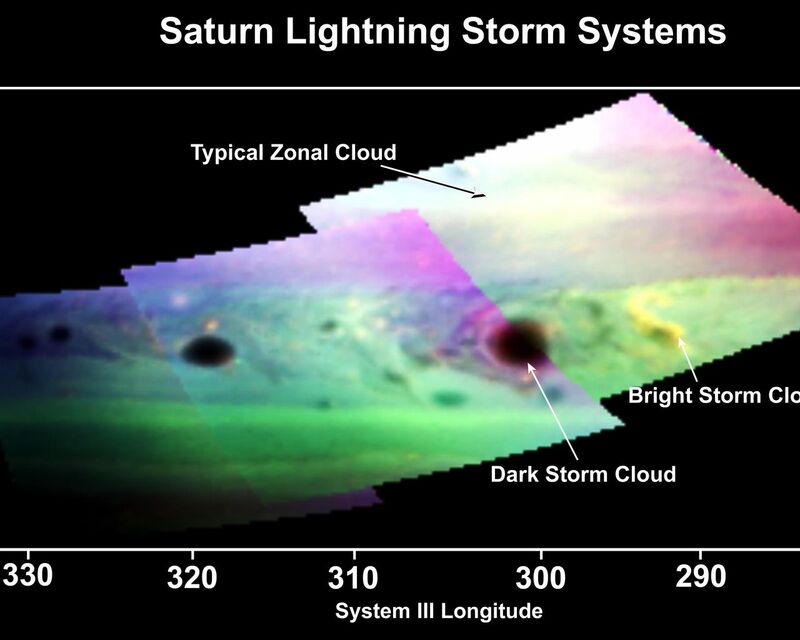 Dark storm clouds are unusually dark at the cloud-sensitive wavelengths designated blue and red. Boosted to higher altitudes by the energy of thunderstorms, the dark material rises to higher levels in the atmosphere where it can be seen. Saturn electrostatic discharge, a sign of lightning, was recorded in the area of the s-shaped cloud. Its lighter color suggests ammonia ice absorption from recently condensed ammonia in upwelling clouds. The data for this image came from Cassini's visual and infrared mapping spectrometer, which can image a scene simultaneously in 352 distinct colors from 0.3 to 5.1 microns in wavelengths. The Cassini-Huygens mission is a cooperative project of NASA, the European Space Agency and the Italian Space Agency. The Jet Propulsion Laboratory, a division of the California Institute of Technology in Pasadena, manages the mission for NASA's Science Mission Directorate, Washington, D.C. The Cassini orbiter was designed, developed and assembled at JPL. The visual and infrared mapping spectrometer team is based at the University of Arizona, Tucson. For more information about the Cassini-Huygens mission visit http://saturn.jpl.nasa.gov/home/index.cfm. The visual and infrared mapping spectrometer team homepage is at http://wwwvims.lpl.arizona.edu.